I am all for learning from new experiences. I seek out new things to get my hands dirty with all the time, but this weekend, I was able to experience one of those things that no one seeks out or ever wants to – bank closure. Late Friday night while I was thinking about investing (yea really, I did just read I Will Teach You To Be Rich and it’s still fresh in my mind) I got an email from the bank (ShoreBank Direct for the curious) that holds my entire emergency fund. I get regular emails from them saying the interest rate has change (usually down) so this wasn’t unusual until I got an identical email from the FDIC a few seconds later. The emails said that the bank is closing it’s doors and the FDIC it taking over. They assured me that my deposits were safe and banking would continue as usual. I didn’t buy that. To be honest, I was pretty nervous about this. Due to a steady decrease in interest rate, I had been planning to abandon ship anyway so I immediately initiated a transfer out of there. In light of this new hiccup in my finances, I thought I would share a couple things I learned about the FDIC and bank closure, first hand. Surprisingly, in that same email from the FDIC, I found that they had already found a buyer for the bank and everything had been transitioned over before I even knew the bank was closed! You see, the FDIC insures just about every bank out there or at least the good ones (banks have to meet certain standards to be FDIC insured), and when a bank goes under, the FDIC is left holding the reins. That’s a lot of responsibility and way too much liability for them, so they line up a buyer for failed banks immediately. As a consumer, when the FDIC takes over a bank, you are the last to know. This is because they want to reduce “runs” on the bank, and keep it operational. You can actually still continue to use the same online interface you have become familiar with, the same checks and debit cards. You are also still required to pay on loans and debts held against you by the bank. Just like HR traditions in a big company for hiring and firing, the FDIC has set up ways to make the closing of banks seamless for everyone involved. They usually close banks on Friday, getting back to business on Monday. If by chance the FDIC doesn’t find a bank to sell the failing bank to, they may operate the bank themselves, as a federally owned bank, for a short time. In the worst case scenario for insured deposits, your funds with the bank will be frozen during this time. Eventually, if no buyer is found and the FDIC decides to stop operating the bank, the FDIC will cut you a check for the amount of money you have with the bank, as long as it is under their insured amount. Uninsured deposits with a failed bank are a different story. 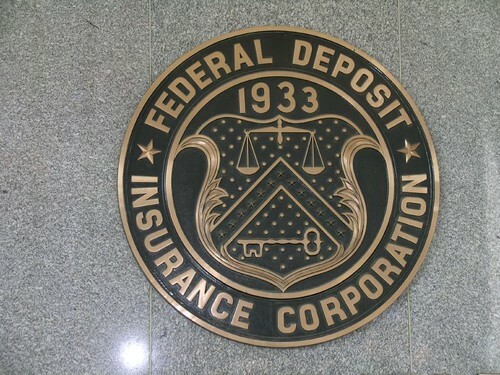 If the bank is sold, the FDIC has to see what money is available to be distributed to those with uninsured deposits. If the bank is never sold, and is closed down, there isn’t much that can be done for your uninsured deposits. If you find yourself with uninsured deposits in a failed bank, that means you had over $100,000 in one bank account and you will be waiting quite some time to see what fate holds for your money. The most important thing I learned though is that bank failures can come out of no where. We are sort of used to hearing about them because of the financial crisis in 2008, but banks did fail before that, and will continue to fail in the future. You will never be able to predict a banks failure and the best thing you can do to make sure you don’t lose money when a bank fails is observe the limits of the FDIC, diversify your holdings between different banks, and always prepare for the worst so when it comes, it’s no surprise. It's so odd to hear that your bank closed without you being aware at all. I used to keep my emergency fund at washington mutual, and then I had started hearing that they were on shaky ground (back in 08). As their picture worsened, the rates they were paying to depositors was INCREASING (it got up to around 3-4%) because they were trying to attract new money to stay afloat, instead of decreasing it (in my mind driving money away). My dad asked me if I was going to move banks, and I told him why bother? The FDIC had me insured if there was a problem with the bank, and it would have been a hassle at the time to change banks. It eventually got moved to chase bank where I got tired of them, then moved to a bank based in your area that paid good rates (Zions Bank). The bank is based in Chicago and all I used was their online savings account. I never heard news of them, even when they were doing good. It was a really weird bank, to be honest..but the rate was the best I could find when I opened it, ING was 1.5 and they were twice that at the time. The most probably reason they closed though is ironically another reason I chose them. They used deposits to help third world countries, which isn't all that profitable 🙂 versus traditional lending. I used to work at Zions Bank, back in 2006-07. They operate really well, internally in my opinion and have very strict policies. Good choice. I also have a friend that worked at WaMu up until the last days..he saw very clearly that what they were doing was going to end up badly. Well that is quite the experience (Amanda here from Yakezie Frugal Confessions). Thanks for sharing! I have read articles, but not read anything from a firsthand experience. Great article, a little scary too,. Great article but not a nice situation to experience. I have been there and know exactly what it feels like.